Progress on the room is moving along. I really wanted to have all the trim work from Metrie up before we brought the furniture into the space but when you are working on a tight timeline you do whatever you have to do to speed up the process so last week we unboxed all the new furniture and moved it up to the room. This was us in the empty space trying to make it all work. Thank goodness for my amazing assistant who is a champ about making it all happen on a tight timeline! Every piece of furniture we brought in to the space in brand new and even though the room isn't even close to done, it feels so good already! You can see a peek of her new DuChateau floors in the photo below. They are the Grand Savoy Marquis Engineered European White Oak 9 1/2" x 86-11/16x5/8 UV Oil Finish Plank and I love them! It is amazing what new and gorgeous floors can do in a space. The entire house feels so much sturdier now and so beautiful! 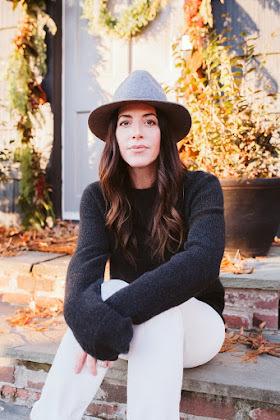 Now that we have all the furniture from One Kings Lane, Overstock, Urban Outfitters and Serena and Lily in place, its time to finish the shiplap on the walls, hang all the lighting from Hudson Valley Lighting, which will require a little bit of electrical, but we can do this! Then its time for a fresh coat of paint and the Chasing Paper wallpaper will be our final step in the process. Here's a little sneak peek of whats to come! I can't lie, these posts are hard. Its so hard to have to keep all the detailed photos from you all and not show you all the progress but I guess thats also part of the fun. I hope you are enjoying these posts because we are almost there you guys. So very close! 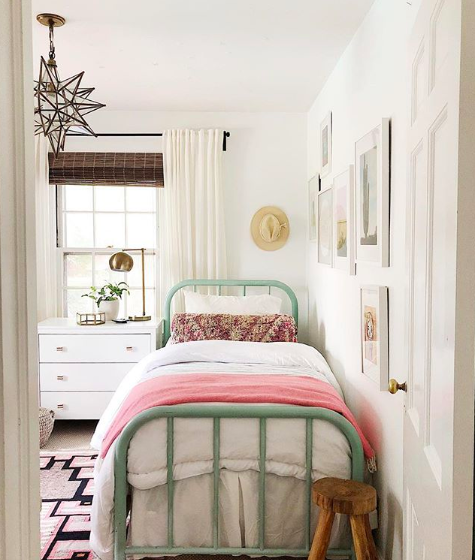 Welp, its week three in this One Room Challenge and honestly I didn't know if I was even going to have this post up today because it's seriously been a challenge! This is the week all the furniture was finalized and by that I mean it's actually here inside our home. As far as I'm concerned, its not final until its actually sitting in front of me! We did have the bed arrive damaged but its okay because the company assured me a new one is on its way, (fingers crossed) it arrives on time and we actually have a bed for our bedroom makeover (sigh). Well, do you want to see what we've selected for her space, so far? 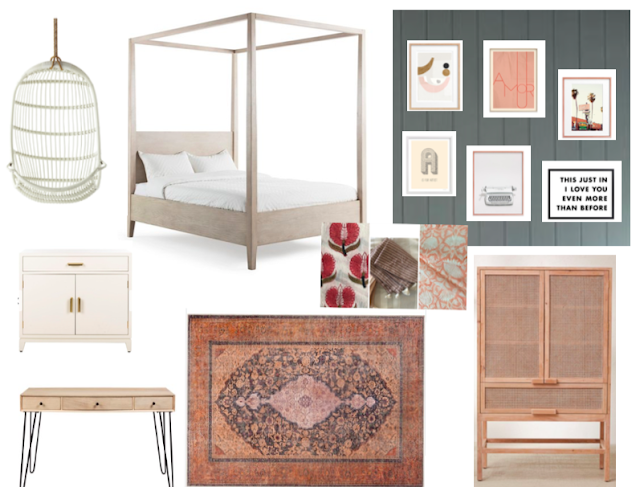 Here is our design board for the room makeover and I think it's going to be pretty darn cute in there. 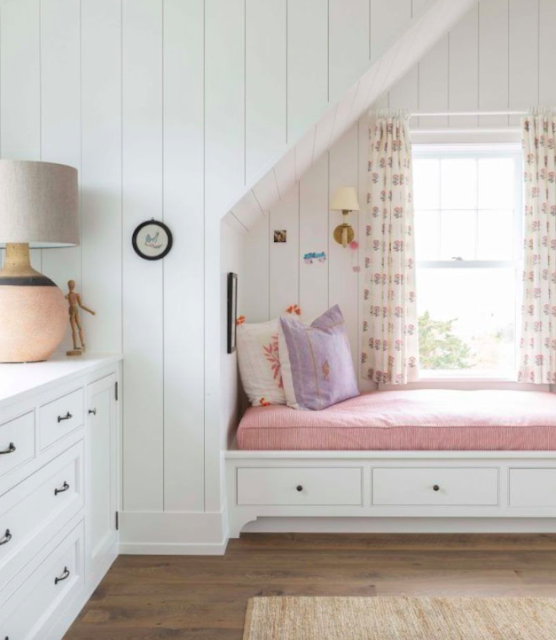 She has been asking for a canopy bed for as long as I can remember, and I have searched for the right one for her, for as long as I can remember! Well, we finally found this one from One Kings Lane and its so pretty. Even prettier in person and I can't wait to share the final photos with you all. We chose this adorable nightstand, desk and rug from Overstock. The Swing chair is the one and only from Serena and Lily and her caned cabinet is from Urban Outfitters. She love UO so of course she wanted some of her furniture to be from their apartment line. The artwork is so precious from Minted. I am still in the process of choosing her bedding but the one item I knew we had to have was a bolster from my friend Jenny Komenda's shop, Juniper Home. I will be sure to link all the items that you see here and much more in the next posts! I have to run for now but please, please come back next week and I will have so much more to share with a lot more details on the furniture I selected and why. Have you caught on yet that The Company Store is my go to resource for all my bedding needs these days? I initially chose them for our master bed and I completely fell in love. I seriously have a bedding hording problem. NO seriously, I do. I don't know why but it's the one thing that I can't seem to keep to a minimum around here. I honestly think its because I am always trying to create the most comfortable bed possible. Not just for me but for my family and our overnight guests. Basically, that means I have collected so much bedding, from blankets, to sheets, to pillows, trying to create that perfect luxury bed and nothing has really met my exceptions until I found The Company Store. I've used it in our bedroom, my daughters shared room and now in our guest room. We are in the midst of a master bathroom and master closet remodel in our home and that mean's our master bedroom is a complete disaster and unusable. We are currently sleeping in our little guest room until the remodel is done and I couldn't do it! I just couldn't sleep on this bed one more night without my The Company Store bedding and down feather bed. Thankfully, I don't have to because all of our new guest room bedding arrived yesterday and last night it felt like I was sleeping in a 5 star hotel again! I know this sounds like I'm just weirdly excited about some bedding. But that's exactly it! I am excited because I'm a firm believer that your bed should be your own little heaven. No place feels as good as sinking in to your own bed after a long day and you should have the very best bedding. Did you know that there are pillows designed for back sleepers, side sleepers and stomach sleepers? Seriously, did you all know this? Well, imagine my excitement when I found them on The Company Store and you know what....they are freaking amazing! The feather bed is another favorite of mine. We have them on all our beds now and it makes such a huge difference. I swear it takes your mattress to a whole new level! Both Brian and have I slept so much better in our newly made beds. Both our master bed and now our temporary bed in our guest room. I could go on for days about the comfort. How soft the sheets are. How the linen duvet gets better with each washing. How soft the blankets are, but lets talk about the color and textures of it all. I love to layer a bed. Lots of texture with different materials and color and I have been so happy with the color selection of each of the items on the bed. The Alpaca throw is simple and gorgeous in the charcoal and I layered the bed with the Spotlight sheet set and the Comfort Wash Pure Linen Duvet. I also added my favorite Honeycomb blanket, which we have on all our beds. To keep it simple but add a pop of color, I added this berry colored linen pillow cover in Clay. For a perfectly layered bed I always follow this recipe and I feel like it never fails! *Always layer your flat sheet so that the "right" side of the sheet is face down on the fitted sheet. That way when you fold it back the "right" side will face up. *Bolster pillow or two square pillows placed in front of your stacked bed pillows. This is my staring point for the project. The canvas on the room if you will. All the items that will cover the majority of square footage in the room. This is how I always start any design project. What is the overall backdrop of the room going to be and how do I build off of that? All of my design has a neutral base. While most people think that means white or light colors, it can also mean color! You can keep a space neutral and still use color, even on the walls. I see it like this, if you choose deeper colors in your design, they tend to allow you to use a lot more color in your design. For instance, dark green can be a neutral if you use it correctly and that goes for a lot of colors. The deeper and darker the better in my opinion. I love using color, especially in a kid's rooms. I like to keep the design structured but also whimsical. I want the room to grow with them and that can get tricky. I will go in to all of that in more depth when we get to the furniture selections, but for now its all about the walls. I have always been a lover of fun wallpaper in my girls rooms, this time is no different. I think it's such a fun and unexpected addition to any little kid or teen space. A perfect way for them to express a little bit of their own personality and a way to make the space unique. 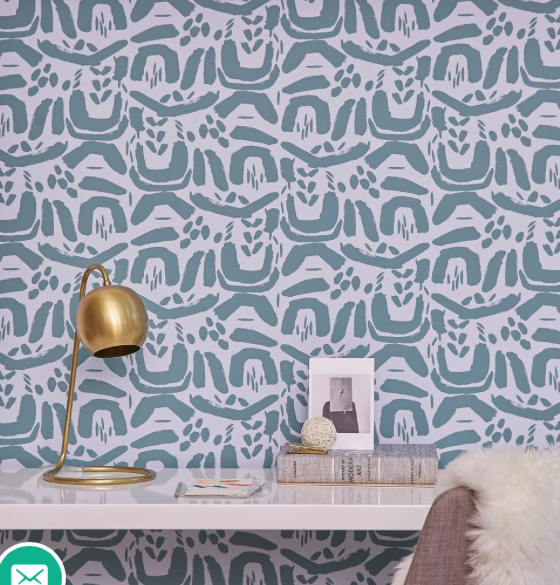 I have always loved Chasing Paper and all of the fun wallpaper design's the offer. I have used their wallpaper in so many project's and they were my go to source again. Because this is a room for my oldest daughter, I wanted to make sure that the wallpaper would fit her personality. I want the room to have a great design but I also didn't want to lose sight that this is her space and she needs to love the final product, even more than me. That's a tough one. I'm working on letting go a little and so far I think we are on the same page, which is good! We decided to go with Chasing Paper Shaping Up on the walls in her space and I think its going to be so cute! Once we receive the paper we will select the wall paint color for her room. If you have followed my designs for awhile now, you know how much I love adding trim work to a space. Her room is no exception and we decided on this amazing product by Metrie . We are using a vertical shiplap along with the wallpaper and new baseboards. I found this image below when I was searching for inspiration for her room and I love how this space looks with all the shiplap. The floors in this space above also look similar to the new flooring that we just had installed by Du Chateau flooring. I do a happy dance each time I walk in to her room now. I do not miss the black painted floors one bit! They were actually kind of the worst, always peeling and showing every spec of dirt...yuck! I have become such a fan of Hudson Valley Lighting and all of their brands. Especially Mitzi for a fun whimsical feeling in her new room. I selected the Avery light above, which coincidentally shares the same name as my daughter! I loved the light and when I saw the name, it was a done deal. 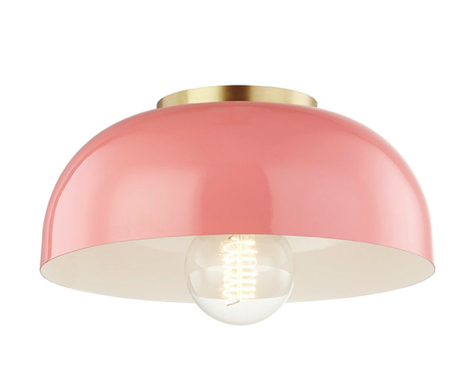 I also chose these super cute sconces from Mitzi for either side of her bed. I love sconces and pretty much want to use them somewhere in every single design I do lately. Brian is in the process of installing all of the shiplap and baseboards now that all the floors are in and the next step is to have the electrician install the sconces and new light. We will install the wallpaper just as soon as all the shiplap is painted but of course we are waiting on the delivery of the wallpaper to pick our final color selection. Hopefully, I can share that with you all on the next post. We are moving right along and I can't wait to show you all the final reveal. Come back next week and I will be talking about all the furniture I selected for the space. Now head over to the other participants blogs and see what they are working on....see you next week!